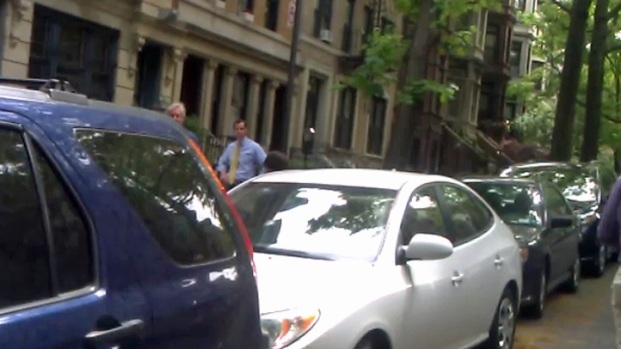 Anthony Weiner was spotted shooting a campaign-style video on the stoop of his childhood home in Brooklyn Thursday as he weighs whether to run for mayor, NBC 4 New York reports exclusively. The Democratic former congressman who resigned his seat two years ago amid a sexting scandal was wearing a shirt and tie and was seated on the steps next to his wife, Huma Abedin, as a camera crew and several other handlers looked on. The crew quickly packed up and left after they were spotted by NBC 4 New York Thursday. The Park Slope home is where Weiner launched his bid for mayor in 2005, and where he later announced that fall he was stepping aside in order to avoid a divisive primary runoff. 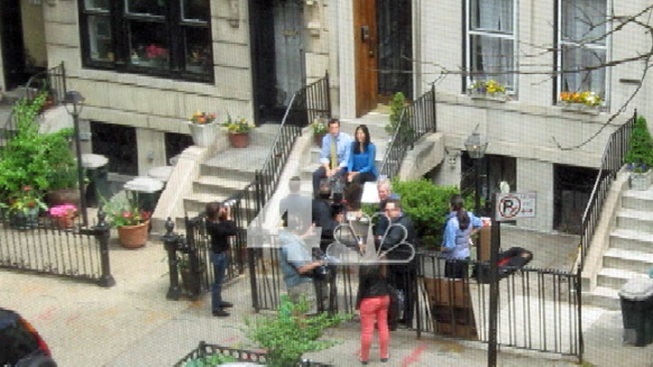 NBC 4 New York spotted Anthony Weiner shooting a campaign-style video at his childhood home in Park Slope Thursday. His crew packed up and left when they were discovered. Weiner did not immediately respond to a request for comment. Weiner first revealed he was weighing a 2013 run for mayor last month in a New York Times Magazine story that detailed his efforts to repair his marriage. He has also hired a campaign manager, according to Politico, and has released a policy booklet. An NBC New York/Marist College poll last month found that if Weiner jumped into the race, he would get 15 percent of Democratic votes, vaulting him straight into second place behind City Council Speaker Christine Quinn but still far from what he’d need to avoid a runoff. Weiner also gave a series of brief television interviews after the Times story. In an interview with NBC 4 New York, he said he would decide soon whether to get into the crowded Democratic race. Weiner said he still had a lot of forgiveness to seek of many other people, including his former constituents and the reporters he lied to. But he also said he hoped that his transgressions would not define his life and career. “I guess I want to be viewed through the full continuum of what people know about me, no one particular chapter,” he said. Anthony Weiner speaks with NBC 4 New York's Andrew Siff for a one-on-one interview, asking for forgiveness from his constituents. This is the first segment in a three-part interview. Watch more of the interview here. He said he wanted to be remembered for his efforts on health care reform, protecting the Rockaways before Hurricane Sandy hit, trying to curb hunger among New York children, and trying to lower taxes on the middle class. Weiner ran for mayor in 2005, and nearly forced a runoff against Fernando Ferrer, but conceded in the name of party solidarity. He planned to run again in 2009, and was considered a leading contender, but dropped out after Mayor Bloomberg chose to run for a third term. Prior to his unraveling, Weiner had begun to plan for a 2013 campaign. He still has more than $4 million in his campaign account.